They say that too many presents make the receivers spoiled. Well, we don’t care. 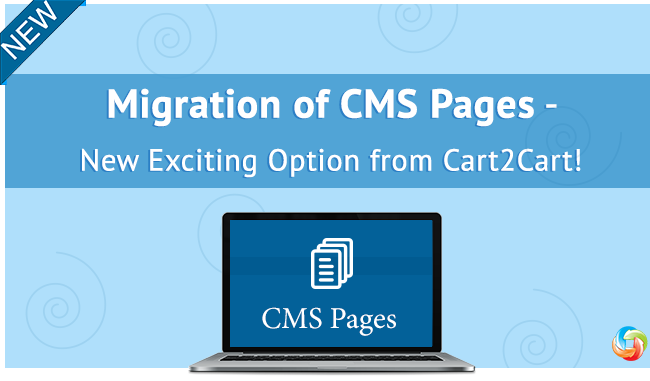 Here’s is another gift for you from Cart2Cart - migration of CMS pages. It takes more to create a memorable online store than pictures of products, prices and “buy” buttons. Additionally, successful retailers provide great content. That means - they’ve got interesting blogs, curious “about us”, “contact us” sections, and other catchy CMS pages. Until this day, merchants had to create the CMS pages one more time on the new cart, after re-platforming. But Cart2Cart has decided to put a stop to that. So, from now on, you can transfer static pages between different versions of Magento, using our service. It doesn’t matter if you’ve got numerous blog articles or a few basic descriptive pages included in the store - we’ll move them all to a new solution, saving your store’s appeal. Although we only provide transfers of CMS pages within Magento and Shopify at this point, we promise to make them possible for other carts in the nearest future. So, stay tuned to our blog and catch the exciting new opportunities right as they appear.